Welcome to "The World". Take a trip into the online world of knights, mystery and magic with Tsubasa, Mimiru, Bear and the rest of the gang as they try to come to an understanding of the link between the game and the real world. 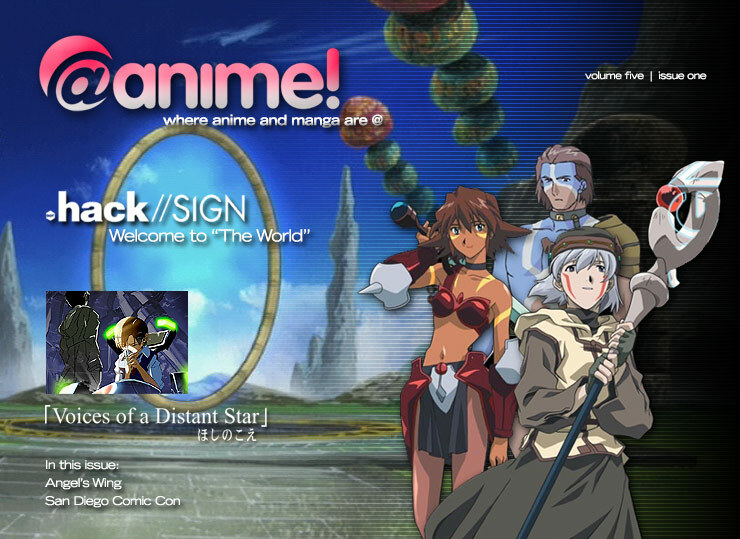 Go ahead and log on as we take a look into the world of .hack//SIGN! In a world of big studio anime productions, every once in a while, someone tries something new. Enter Makoto Shinkai. He set out to create a one man show, literally. And the result? A short story worthy of a major studio. Check out the process and the result with Voices of a Distant Star. 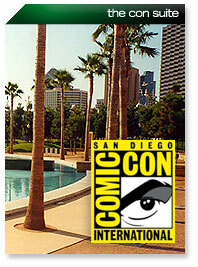 Coming to you live (on a taped delay) from San Diego Comic-Con International, it's the NEW @anime! magazine. It's been a while since you've seen us, but we're up and running again and we have some good stuff coming... click on over and see what's in store. It's as opinionated as you can get. And rightly so. It's a new column so straight to the point, it could only be called "Because I Said So". James Alsup, the artist formerly known as CornBoy, hails from Chicago. His hobbies are collecting shoes, smoking cigars, drinking beer, eating meat, and watching anime/reading manga. In that order. Take a look as James talks about a generation past and why they should get with the times or get the heck off the Catbus. It's the first manga project from PLEX Industrial Design. Mary is an up and coming angel who needs to do some training amongst the folks here on Earth. See what happens when she comes on down and starts her "training" in Angel's Wing! It's big time convention time as the @anime! and Anime Reactor crews head to the San Diego Comic-Con International! The anime scene shows it's true force of nature as Japan takes over programming rooms, merchandising options and a good chunk of print exhibit hall real estate! Come on and see what's coming from some of your favorite anime companies and join us as we take photos, enjoying the sites of Southern California!